"Late in 2011, Herald and News reporters traveled up and down the Klamath River in search of stories that demonstrate how the people along the river are united. 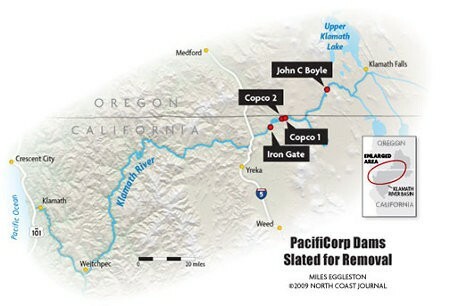 Though each section of river has its own personalities and problems, the water that stretches from Upper Klamath Lake to the Pacific Ocean brings all the regions together." The reports range from historical fact sheets on each dam to colorful portraits of individuals from the upper basin on down to the mouth -- including portraits of goats in the Seiad Valley, ocean and river fisherfolk, potato farmers, a ranching family that still bucks hay by hand, a Hoopa Valley tribal member and more.